Customize your longbow or recurve by selecting from our many options. 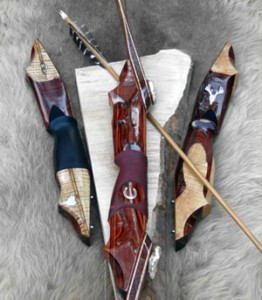 We have many pictures in our gallery to help you customize your bow. Most veneers can be included with no additional cost. Some veneers are expensive and will be priced accordingly. 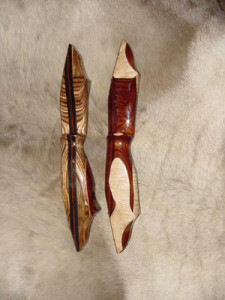 *Bill Slusser, a master gunsmith will be custom checkering the grips on longbows and recurves. Bill handcrafts custom flintlocks full time. His workmanship is known throughout the country. If you desire he will do custom inlays, such as scrolls, flowers, and even hunting scenes on riser sections using sterling silver or gold wire inlayed into the riser. This guy is the best I’ve seen! **Double Shelf-a new double shelf longbow is now available, right or left hand with standard locator grip, two shelves on the same side of the riser, two nocking points on the string. Just slide the shaft up or down the string and switch hands, now when that critter comes in on the wrong side of the tree, if you “PRACTICE” you can take the shot.